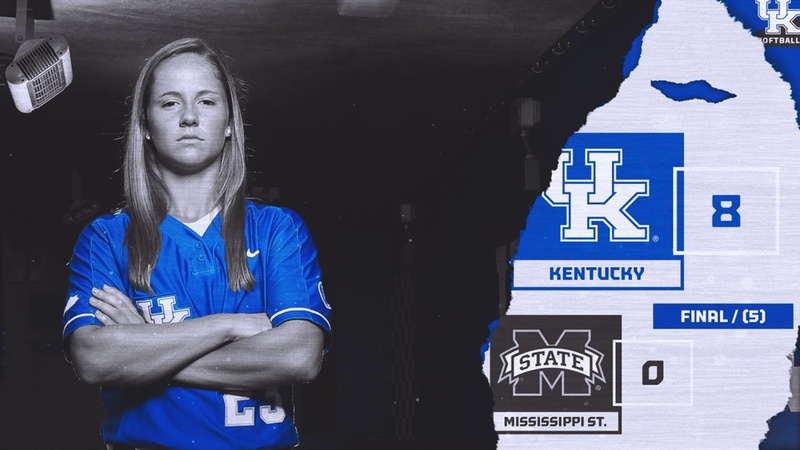 Kentucky continued their SEC play when they hosted Mississippi State at John Cropp Stadium Friday night in Lexington. Katie Reed tied Kentucky’s school record with 6 RBIs, and knocked two home runs, both three-run shots, as No. 15 Kentucky routed Mississippi State, 8-0. This was the 34th time in Kentucky program history that a Kentucky player hit two homers in the same game. With runners on the corner and two outs in the first inning, Mallory Peyton hit a single to the left field to Kayla Kowalik. This was followed by a tape measure shot by Katie Reed to put Kentucky up by 4. (Kentucky 4, MSU 0). In the bottom of the third, a Miss St fielding error plated a run and Katie blasted another three run shot to center field to score three more. Friday’s game was Kentucky’s quickest game of the season only lasting one hour and nineteen minutes. Game two of the series will be Saturday at Noon ET and can be watched on SEC Network.